As you use the spell-checking capabilities of Excel, you undoubtedly have added words to your custom dictionary. Normally you do this when you run across a word that the main dictionary does not understand, but which you know is correct. When you click on the Add button in the spell-check dialog box, the word is added to your custom dictionary. When you add a word to your custom dictionary, it is added to the same custom dictionary that is used by other Office applications, such as Word. This dictionary is nothing but a plain text file that contains the list of added words, one per line. The default name for the custom dictionary is Custom.dic, and you can search for it using the Find feature in Windows. When you locate the custom dictionary, you can load it into Notepad and make any changes you want. The only thing to be careful about is that you put only one word per line, and that you don’t save the file in any format except plain text. This is why it is preferred that you use Notepad to edit the file, rather than a program like Word or Excel. 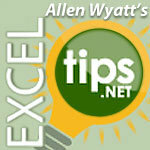 Excel Tips Microsoft Excel. permalink.